I like my sticky chicken really sticky. Prior to the Instant Pot, I always cooked my drumsticks in a cast iron. Dark and crispy on the outside, finished with a lid on top for cooking through the center. While this is still a favorite, pressure cooking has officially one-upped my beloved cast iron method. If you know anything about how I feel about cast iron, you know this decision was not taken lightly. Check out the images above! The meat has pulled fully away from the bone, which indicates just how tender and juicy it is. And as usual, I utilized one my favorite aspects of the Instant Pot here. Browning, cooking, and making a sauce all in one pan. So while there are a few shuffling steps to this recipe, it comes together easily with very few dirty dishes. Carefully read through the instructions for the Instant Pot indicators and valve settings. If you don’t have alllll the spices listed, either go to the bulk spices section of Sprouts, Whole Foods, etc and get a super small amount to try them out in this recipe OR just leave out what you don’t have. It’s hard to mess up this blend. If you don’t have an Instant Pot, a slow cooker should work (although I haven’t tried it). Brown the meat over the stove, move the chicken to your slow cooker, and cook on high heat until done. You may need to add a small amount of liquid to the slow cooker to help things along. Then add the juices from cooking to a saucepan with the honey, molasses, and lemon juice/zest and simmer until thick and syrupy. Enter your email to get a FREE printable PDF of this recipe! You'll also get my weekly letters designed to help you successfully & sustainably transition to a Paleo-style diet. Pat the chicken dry with paper towels. Make the spice rub by combining the paprika, garlic powder, cumin, ginger, cinnamon, coriander, saffron (crush it into small pieces between two hands or with a mortar & pestle), sea salt, and black pepper. Coat the chicken with the rub well on all sides. Set the Instant Pot to “Saute” with the lid off. When it reads “Hot,” grease the bottom with a small amount of avo oil, ghee, or lard. Brown the drumsticks on all sides, about 15 minutes in total. Add the broth to the pot. Turn the Instant Pot to “Keep Warm/Cancel” and put the lid on. Set to “Manual” and move the time to 10 minutes. Make sure the steam valve is set to “Sealing,” as we are using pressure to cook the drumsticks. After the drumsticks have finished, press the “Keep Warm/Cancel” to turn it off. Release the pressure by moving the steam valve to “Venting.” Always use caution as the steam is hot. Note: do not use the optional natural steam release here, as it can cause the chicken to continue to overcook and become dry. Remove the lid and with tongs, carefully move the chicken (it may be falling off the bone) to a large bowl and cover it tightly with foil to keep warm. Leave the juices rendered from the cooking process in the pan. Turn the Instant Pot to “Saute” again and keep the lid off. In a small bowl, whisk together the honey, molasses, lemon juice and zest. Pour into the pot with the reserved cooking juices. When the indicator hits “Hot,” you should have a rolling boil. Whisk occasionally (being cautious of the steam) until the liquid has reduced to a thick sauce, about 5-10 minutes. If you accidentally let it go too long, it’ll get too thick and sticky to use. Simply add a couple of tablespoons of water and whisk to smooth it out. 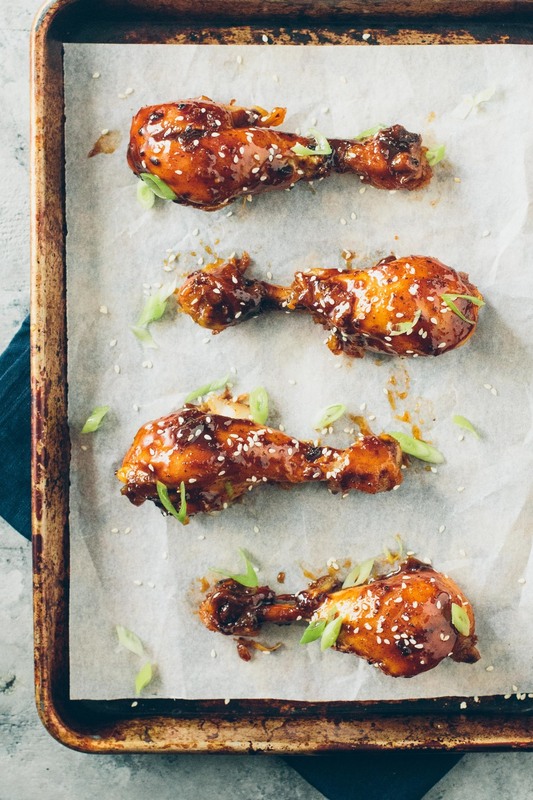 Coat the drumsticks with the sauce. Serve garnished with sesame seeds and chopped scallions, as desired. I made this recently and it was delicious. Drawn to the awesome picture on pinterest! 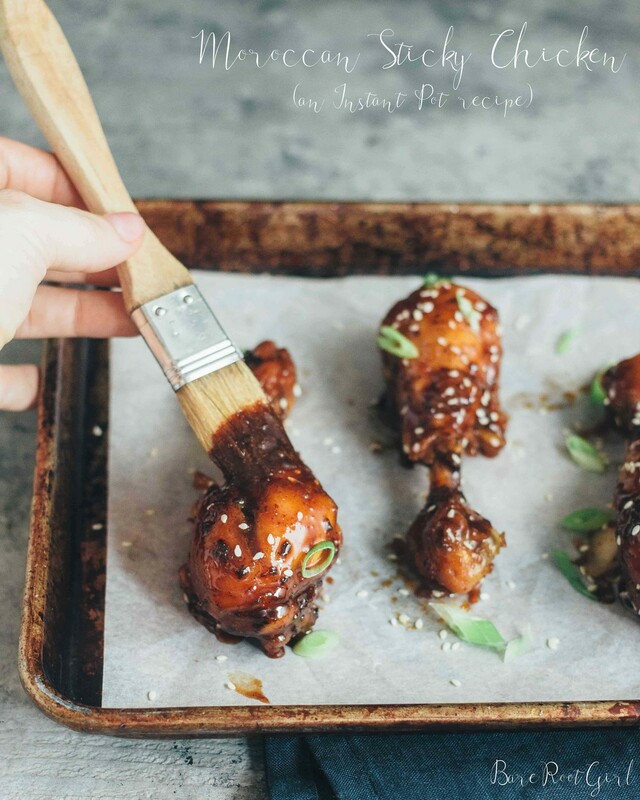 I’ve fixed quite a few drumstick recipes recently in my instant I’ve found 18-21 minutes on high works great with natural pressure release if I have the time. I’ll definitely make this again but either increase the amount of chicken or cut in half the other ingredients (accept broth). I am surprised at the higher cooking time but I’m glad you enjoyed the recipe! I have yet to try it with more than 6 drumsticks, as I get a little paranoid (probably unnecessarily so) when not everything is touching the bottom. 🙂 Thank you for sharing your feedback! This rub and sauce mix was great with an instant pot chuck roast I made recently as well! Skin on or off the chicken? I prefer skin-on. I think it’s difficult to find skinless drumsticks anyhow. I need to double the recipe to have enough for my family. Do you double everything? I’ve read that for some IP recipes, you double everything except for the liquid. Time should stay the same I’ve read. Pingback: The 10 best family friendly Instant Pot recipes we've tried in 2017 so far. This was a big hit for my family, thank you! Giving this a go right now! I wasn’t sure whether this should be 10 minutes on high or low, might be worth mentioning that in the article. If I want to triple this recipe, how much time should I add? Would it simply be triple the 10 minutes? Hey Angie! Did you give it a shot? You shouldn’t need to triple. At most double. Hey Kara! I still haven’t tried this with a crock pot so I am guessing a bit (with a little help from google). You’ll want to brown them in a cast iron, then move them to your crock pot. Medium to high heat for 4 hours, or until very tender (you’ll need to add the broth in with the chicken in the crock pot). Then remove the chicken to a separate bowl and transfer the juices to a stock pot. Add the honey, molasses, and lemon juice to the pot and simmer until reduced and sticky. Let me know if you try it! Made this tonight using boneless breast strips and it was fantastic! Can’t wait to try it with the drumsticks. Followed directions exactly but changed cooking time on instant pot to 4 minutes due to boneless and strips – perfect! can this be adapted for chicken thighs? Hey Jason! Instructions should be exactly the same for thighs, so long as they are bone-in. If they’re not bone-in, use the manual setting for 15 mins, natural release for 10 mins. then open the valve and quick release. This is a great recipe. The one change I made, since it was Moroccan, was to use pomegranate molasses instead of black strap. Oh, wow! That sounds like a great adjustment! Thanks for the feedback! The rub flavors were good. I doubled the batch as I have a family of 5 to feed. After about 10 mins of simmering my sauce did not get sticky or thicken up. It was a little disappointing considering the rub spices (saffron is spendy!). Hey Laura, sounds like either you didn’t have Saute on “More” heat or it just needed to go a little longer. If you still have the sauce, try simmering again until it gets thick. Sorry for the trouble! Hey! I’m new to the instant pot! Not seeing a setting on it for manual? Should i do 10 minutes on the poultry setting? I’m guessing you have a Duo model? The “manual” button is the same as the “pressure cook” button. This form collects information used to send you recipes & special deals. We won't share or sell your information. You can unsubscribe at any time.